Greeley is the home rule municipality that is the county seat and the most populous municipality of Weld County, Colorado, United States. Greeley is in northern Colorado and is situated 49 miles (79 km) north-northeast of the Colorado State Capitol in Denver. According to a July 2015 estimate by the U.S. Census Bureau, the population of the city is 100,883, and a 2014 population estimate made Greeley the 12th-most populous city in Colorado. Greeley is a major city of the Front Range Urban Corridor. Location of Greeley in Weld County, Colorado. The town was named after Horace Greeley, editor of the New-York Tribune, who came to Colorado in the 1859 Pike's Peak Gold Rush. 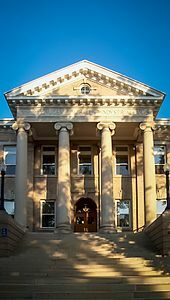 It was founded as the Union Colony in 1869, an experimental utopian society, but the name was later changed in honor of Greeley. Governor Benjamin Harrison Eaton declared Greeley an official city on April 6, 1886. Greeley was built on farming and agriculture, but kept up with most modern technologies as they grew. Telephones were in town by 1883 with electric lights downtown by 1886. Automobiles were on the roads alongside horse drawn buggies by 1910. KFKA became one of the first radio stations to broadcast in the US in 1922 and the Greeley Municipal Airport was built in 1928. Greeley housed two POW camps in 1943, during World War II. One was for German POWs and the other was for Italian POWs. A vote to allow the sale of alcohol passed by a mere 477 votes in 1969, thus ending temperance in the city. The Greeley Philharmonic Orchestra was started in 1911. In 1958, Greeley became the first city to have a Department of Culture. Greeley is still growing and changing today; its population has more than doubled since 1970. Greeley is located in (or just west of) the area previously occupied by the Overland Trail station of Latham (originally called the Cherokee City Station). The Latham station (also known as Fort Latham) was built in 1862 and named in honor of Milton S. Latham, one of California's early senators. The stagecoach station was at the confluence of the South Platte River and the Cache la Poudre River. It is believed that here occurred the birth of the first white child born in Colorado, a girl. Fort Latham was the headquarters of the government troops during the Indian conflicts of 1860–1864 and the county seat (the post office being called Latham). Greeley began as the Union Colony, which was founded in 1869 as an experimental utopian community "based on temperance, religion, agriculture, education and family values." by Nathan C. Meeker, a newspaper reporter from New York City. Meeker purchased a site at the confluence of the Cache la Poudre and South Platte Rivers (that included the area of Latham, an Overland Trail station), halfway between Cheyenne and Denver along the tracks of the Denver Pacific Railroad formerly known as the "Island Grove Ranch". The name Union Colony was later changed to Greeley in honor of Horace Greeley, who was Meeker's editor at the New York Tribune, and popularized the phrase "Go West, young man". Greeley is located in the High Plains of northern Colorado about 25 mi (40 km) east of the Rocky Mountains and north of Denver. Greeley is bordered on the south by the towns of Evans and Garden City. The Greeley/Evans area is bounded on the south by the South Platte River, and the Cache la Poudre River flows through north Greeley. The city is served by US Route 85 and US Route 34. According to the United States Census Bureau, the city has a total area of 30.0 sq mi (78 km2), of which 29.9 sq mi (77 km2) is land and 0.1 sq mi (0.26 km2) (0.30%) is water. Greeley experiences a semi-arid climate (Köppen BSk). High temperatures are generally around 90–95 °F (32 °C) in the summer and 40-45 °F (4 °C) in the winter, although significant variation occurs. The hottest days generally occur around the third week of July and the coldest in January. Nighttime lows are near 60 °F (16 °C) in the summer and around 15–20 °F (−9 °C) in the winter. Record high temperatures of 112 °F (44.4 °C) have been recorded, as have record low temperatures of –25 °F (–32 °C). The first freeze typically occurs around October 10 and the last can happen as late as May 4. Extratropical cyclones which disrupt the weather for the eastern two-thirds of the US often originate in or near Colorado, which means Greeley does not experience many fully developed storm systems. Warm fronts, sleet, and freezing rain are practically nonexistent here. In addition, the city's proximity to the Rocky Mountains and lower elevation, compared to the mountains west of the city, result in less precipitation and fewer thunderstorms. This is paradoxical, because adjacent areas (mostly farmland) experience between 7 and 9 hail days per year. The climate in Greeley, as well as all of Colorado, is extremely dry. The Chinook winds coming off the mountains often raise temperatures to near 70 °F (21 °C) in January and February, and sometimes to near 90 °F (32 °C) in April. Greeley's elevation and low year-round humidity means that nighttime low temperatures are practically never above 68 °F (20 °C), even in the hottest part of the summer. The diurnal temperature range is usually rather wide, with a 50-degree (Fahrenheit) difference between daytime highs and nighttime lows not uncommon, especially in the spring and fall. Rapid day-to-day and diurnal fluctuation in temperature is also common. As of the 2010 census, there were 92,889 people, 33,427 households, and 21,250 families residing in the city. The age distribution shows 68,936 residents are age 18 and older and 23,953 residents are under 18 years of age. The age distribution of the population showed 31.3% from 0 to 19, 11.4% from 20 to 24, 25.4% from 25 to 44, 21.1% from 45 to 64, and 10.7% ages 65+. The median age was 30.5 years old. The gender distribution was 49.1% male and 50.9% female. For every 100 females, there were 96.6 males. For every 100 females age 18 and over, there were 93.9 males. The racial makeup of the city was 79.1% White, 1.7% African American, 1.2% Native American, 1.3% Asian, 0.1% Pacific Islander, 13.2% from other races, and 3.4% from two or more races. Hispanic or Latino of any race were 36.0% of the population. Out of 33,427 total households, 21,250 (63.3%) were family households where at least one member of the household was related to the householder by birth, marriage, or adoption. 12,177 (36.4%) households were non-family households consisting of people living alone and households which did not have any members related to the householder. Of the 21,250 family households, 11,495 (54.1%) had children under the age of 18 living with them. The population density was 3,096.3 people per square mile (1,195.5/km²). There were 36,323 housing units at an average density of 1,210.7 per square mile (467.5/km²). The median income for a household in the city was $44,226, and the median income for a family was $55,277. Males had a median, full-time income of $40,122 versus $35,294 for females. The per capita income for the city was $21,372. 15.7% of families and 23.5% of the population had income below the poverty line during the 12 months prior to being surveyed. People with incomes below the poverty line include 32.1% of those under age 18 and 8.9% of those age 65 or over. The crime rate (per 100,000 people) is below the national average, according to city-data.com. The website gave the city an aggregate crime rating of 289.6 in 2012, against a national average score of 301.1. Among the companies based in Greeley are the meatpacker Swift & Company, the outsourcing company StarTek, and the contractor Hensel Phelps Construction. The Colorado/Kansas operations of natural gas utility Atmos Energy are based in Greeley. The 233rd Space Group (233 SG) is a unit of the Colorado Air National Guard located at Greeley Air National Guard Station, Greeley, Colorado. In 2014 the Greeley Creative District was certified as an official Creative District by the Colorado Office of Economic Development and International Trade. Greeley is home to the Union Colony Civic Center, one of the largest performing arts venues in Colorado. The 1686 seat Monfort Concert Hall hosts touring Broadway musicals, concerts, comedians, along with regional and local performing arts groups. The 214 seat Hensel Phelps Theatre hosts The Stampede Troupe in addition to lectures, meetings, and smaller performances. In addition, the Tointon Gallery presents a dozen exhibits annually by local, regional, and national artists, and is free to the public. Owned and operated by the City of Greeley, the Union Colony Civic Center sponsors many events held by the University of Northern Colorado, Greeley Philharmonic Orchestra, the Greeley Chorale and the Stampede Troupe theater company. Guggenheim Hall, University of Northern Colorado. Of Greeley residents ages 18+, 82.2% are high school graduates and 25.9% have a bachelor's degree or higher. Most areas in Greeley lie in Weld County School District 6. Four high schools, Greeley Central High School, Greeley West High School, Jefferson High School and Northridge High School, are in and serve Greeley. There are four middle schools, which serve grades 6–8: Brentwood Middle, Franklin Middle, Heath Middle, and Prairie Heights Middle School. There are 14 elementary schools in Greeley serving kindergarten through 5th grade: Centennial Elementary, Dos Rios Elementary, East Memorial Elementary, Heiman Elementary, Jackson Elementary, Madison Elementary, Maplewood Elementary, Martinez Elementary, McAuliffe Elementary, Meeker Elementary, Monfort Elementary, Bella Romero Academy, Scott Elementary, and Shawsheen Elementary. Greeley is also home to University of Northern Colorado, Aims Community College, Academy of Natural Therapy, and Institute of Business & Medical Careers. Greeley is a sister city to Moriya, a city located in Japan's Ibaraki Prefecture. Every other summer 18 students from Moriya come to Greeley for a week-long stay. North Colorado Medical Center, a full-service state-of-the-art hospital and one of Greeley's largest employers. North Colorado Medical Center is the primary medical facility for Weld County. The hospital opened in 1904 as the Greeley Hospital. The name of the facility evolved over the years to Weld County General Hospital and that became North Colorado Medical Center. The Center is operated by Banner Health-based out of Phoenix, Arizona. The hospital recently expanded its facilities and added a new addition which expanded its emergency room and increased the amount of rooms available for patients in other departments. On June 23, 2011, Poudre Valley Health Systems and the University of Colorado Medical School announced a pending joint operations agreement. If approved, it would overtake NCMC as the largest regional hospital in Northern Colorado. In 2010, Greeley Medical Clinic, the largest and oldest medical group in Greeley announced it was affiliating with PVHS. Poudre Valley Health Systems merged with University of Colorado Health in 2011 resulting in new and improved healthcare facilities all around Colorado. A brand-new 153,300 foot hospital in West Greeley is set to open in Spring of 2019. The UCH faciltiy will provide Greeley residents with an additional option for inpatient healthcare services rather than only NCMC and is conveniently located off of Highway 34. Since 2006, the Greeley Police Department has received more than $2.3 million of tactical military equipment from the United States Department of Defense (DoD) including a "mine resistant vehicle", 72 5.56 mm rifles, 22 suppressors, and 15 sniperscopes. Prior to 2014, when the information was made public by the DoD in response to public scrutiny over widespread police militarization in the United States, the program details had been closely guarded and little information had been released during the previous 20 years. On December 12, 2006, the Immigration and Customs Enforcement (I.C.E) staged a coordinated predawn raid at the Swift & Co. meat packing plant in Greeley and at five other Swift plants in western states, interviewing undocumented workers and hauling hundreds off in buses. Greeley was featured in the books Fast Food Nation and Chew on This by Eric Schlosser. On May 12, 2014, Greeley was ranked number #5 of 10 "Top Small Cities for Jobs" in a Forbes article. On July 23, 2014 Forbes ranked Greeley as #4 of 10 "List of Best Cities for Job Growth "
James A. Michener attended Colorado State College of Education, now the University of Northern Colorado, in 1936–37. He was a social science educator at the training school and at the college from 1936 to 1941. He conceived the idea for his acclaimed 1974 novel Centennial during his stay in Greeley, basing it on the real history of the town and the Colorado region. Egyptian Islamist Sayyid Qutb studied at the Colorado State College of Education, now the University of Northern Colorado, in 1949. Multi-award-winning science fiction author Connie Willis attended the University of Northern Colorado and resides in Greeley with her husband Courtney, a former physics professor there. Charles C. Townsend, former mayor of Greeley, member of the 15th General Assembly of Colorado, lawyer, publisher of the Weld County Republican and Greeley Pioneer. ^ "City Council Members". City of Greeley. Retrieved 14 August 2016. ^ "American FactFinder". United States Census Bureau. Retrieved June 15, 2015. ^ "QuickFacts: Greeley city, Colorado". U.S. Census Bureau. Retrieved 7 November 2016. ^ Dawson, John Frank. Place names in Colorado: why 700 communities were so named, 150 of Spanish or Indian origin. Denver, CO: The J. Frank Dawson Publishing Co. p. 25. ^ a b c d e f g h i "Greeley History Museum". GreeleyHistoryMuseum. Retrieved 2014-06-23. ^ "Colorado Judicial Branch". courts.state.co.us. ^ "Greeley, Colorado History for Kids". Greeleyhistory.org. 2013-07-21. Retrieved 2013-09-13. ^ "History of Greeley". Greeleygov.com. Archived from the original on 2013-09-13. Retrieved 2013-09-13. ^ UCAR: Hail Archived 2009-10-15 at the Wayback Machine. ^ "NOWData - NOAA Online Weather Data". National Oceanic and Atmospheric Administration. Retrieved August 20, 2015. ^ "2008-2012 American Community Survey". U.S. Census Bureau. Retrieved March 27, 2014. ^ "Greeley, Colorado (CO) profile: population, maps, real estate, averages, homes, statistics, relocation, travel, jobs, hospitals, schools, crime, moving, houses, news". City-data.com. Retrieved 2013-09-13. ^ "City of Greeley CAFR" (PDF). Retrieved 2019-02-27. ^ "Colorado Creative Districts", Retrieved 23 June 2014. ^ "2012 American Community Survey, Retrieved 28 March 2014. ^ "Weld County School District 6: Middle Schools", Retrieved 28 April 2013. ^ "Weld County School District 6: Elementary Schools", Retrieved 28 April 2013. ^ "Poudre Valley Health System, University of Colorado Hospital announces partnership". www.greeleytribune.com. Archived from the original on 2012-03-17. Retrieved 2013-09-13. ^ "Prefabrication process keeps UCHealth Greeley Hospital on track". Retrieved 2018-06-27. ^ Musgrave, Shawn; Meagher, Tom; Vong, Iva r; Dance, Gabriel (2014-12-05). "The Pentagon Finally Details its Weapons-for-Cops Giveaway". MuckRock News. Retrieved 2014-12-07. ^ Raabe, Steve (August 29, 2010). "New Leprino Foods plant could make the Greeley area flow with milk and money". Denver Post. Retrieved August 29, 2010. ^ Kotkin, Joel. "No. 5: Greeley, CO - pg.6". Forbes. ^ Badenhausen, Kurt. "#4 Greeley, Colo. - pg.4". Forbes. ^ "James A. Michener Library". University of Northern Colorado. 2006-08-08. Archived from the original on 2008-04-30. Retrieved 2008-03-18. ^ "UNC Notable Alumni". Weld County Government. Retrieved 2014-04-02. ^ "Taryn Hemmings". ChicagoRedStars.com. Retrieved 4 October 2014. ^ "Greeley math whiz cracks old equation". greeleytribune.com. April 17, 2005. Retrieved January 7, 2011. ^ Sayyid Qutb. "The America I Have Seen: In the Scale of Human Values" (PDF). Archived from the original (PDF) on 2014-07-12. One night I was in a church in Greeley, Colorado, I was a member in its club as I was a member in a number of church clubs in every area that I had lived in, for this is an important facet of American society, deserving close study from the inside. After the religious service in the church ended, boys and girls ...proceeded through a side door onto the dance floor ...And they danced to the tunes of the gramophone, and the dance floor was replete with tapping feet, enticing legs, arms wrapped around waists, lips pressed to lips, and chests pressed to chests. The atmosphere was full of desire. ^ Robert Siegel (May 6, 2003). "Sayyid Qutb's America: Al Qaeda Inspiration Denounced U.S. Greed, Sexuality". Egyptian writer and educator Sayyid Qutb spent the better half of 1949 in Greeley, Colo., studying curriculum at Colorado State Teachers College, now the University of Northern Colorado. What he saw prompted him to condemn America as a soulless, materialistic place that no Muslim should aspire to live in. ^ David Von Drehle (February 2006). "A Lesson In Hate: How an Egyptian student came to study 1950s America and left determined to wage holy war". Smithsonian. Archived from the original on 2009-04-19. curvy jezebels pursued boys with "wide, strapping chest[s]" and "ox muscles," Qutb added with disgust. Yet no matter how lascivious his adjectives, the fastidious, unmarried Egyptian could not convincingly portray the church dances and Look magazines he encountered in sleepy Greeley as constituting a genuine sexual "jungle." Wikimedia Commons has media related to Greeley, Colorado. Wikisource has the text of the 1911 Encyclopædia Britannica article Greeley.